Photo: Courtesy of Mind Of A Chef/PBS. Full disclosure: We love TV. So much so that sometimes we'd rather spend a whole weekend in front of the tube than dancing in da club. Is a lack of television service holding you back from feeling our joy? No problem! You can get by just fine on Netflix, Hulu, and the myriad other streaming services rapidly taking over the home entertainment industry (thank you, Internet!). Some shows are just better when binge-watched. Whether it's the latest BBC comedy, a PBS miniseries from the '70s, or just that cultish show prematurely scrubbed from a network, we're hooked on the stream. Staying In(stant) is your guide to the best of streaming content. Each week, we bring you a show we're obsessed with and think you should be, too. This Week: The first season of the PBS series The Mind Of A Chef — the show you watch while eating instant ramen and feeling a thousand times more awful about it because you're, well, eating instant ramen in your living room and not real ramen in Japan. How I Got Hooked: For some reason, PBS just does food and cooking-related shows a helluva lot better than cable channels like Food Network. There aren't any celebrity chefs or crazy reality competitions, just good ol' quality programming. But, that's not even why I love the show. 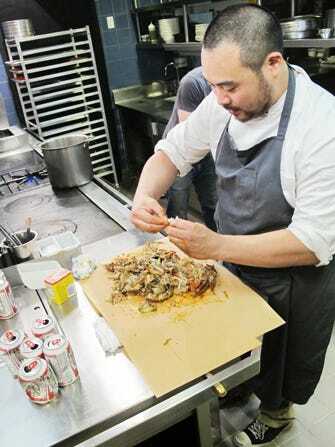 It's because the host of the first season, Momofuku's David Chang, is just so good at balancing his boy-next-door personality with his impressive résumé and plethora of scientific facts that he never comes off as a pretentious Michelin-rated chef (he has two stars, FYI). Instead, he just seems like a regular Joe who loves, loves, loves food. Cameos by chef friends like René Redzepi, Wylie Dufresne, and Christina Tosi are pretty cool, too. Best Episode: The very first episode. Sorry, spoiler alert: A Michelin-rated chef eats raw, uncooked ramen complete with MSG powder — #nomnom. Why You'll Love It: The series has a good balance of humor, history, science, and food. It's basically a show for foodies who want to learn more about food, not just whatever's trendy or sold out of a truck. And, bonus: If you love Japan, you're going to want to make a list of every restaurant Chang and company visit.